Maintaining any type of wood floor, be it hardwood, softwood, parquet or floorboard, requires more than just regular washing up and drying. In order to preserve your floor for years, it needs professional maintenance that restores the material. With our floor sanding service for Earls Court SW5, your floors shed their imperfections and live on to serve you for decades. 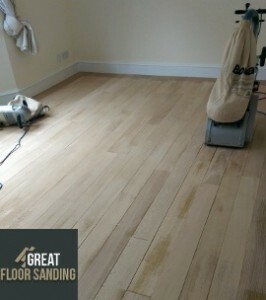 Wood Floor Sanding in Earls Court SW5 – Because You Deserve The Best! Repair and Restoration: All damaged boards are removed and replaced with matching ones. Loose beams are secured. Gap Filling: the floor specialists can fill all the gaps in your flooring in an instance. Floor Sanding: During the sanding process the old sealing is stripped from your wood floorings. All imperfections and damage are removed. An increase of Your Value: Wooden floors are incredibly valuable, so maintaining yours raises the average price of your property. Prolong the Floors’ Life: Professional sanding and sealing can preserve the floor for decades. Impressive Look: Nothing looks better than a freshly sanded floor. Easy-to-clean: Once sanded, your floors demand little maintenance time and effort to clean them. Cleanliness and precision are the main principles in our floor sanding work in Earls Court. All working technicians are BONA certified. They all know how to treat all types of wood: hardwood, softwood, fresh or aged material. Forget about sawdust! The latest sanding equipment from BONA is 99% dust-free. Book Affordable Wood Floor Sanding Now! The procedure of scheduling your wood floor sanding is very easy. Call 020 3404 9697 now and tell us your address and what type of floor you have. The team arrives for a 100% no-obligation inspection. You can do this any time of the way. We serve residents, institutions and companies alike from Monday to Sunday, bank and national holidays included. You also have the option to make changes to your appointment up to 24 hours before arrival, and you can reach us via the Internet using our contact form and chat facility.